Many of the trends that we wrote of last month are still very much in effect. The Water element continues to be strong. Until the 20th, up to 70 per cent of the planets are in water signs. Keep in mind our previous discussion. When water is strong people tend to get depressed more easily. They view the world - the future - according to the mood of the moment. Logic is completely over-ridden. Understanding this - and this is what astrology is really all about - will help you to handle this better. 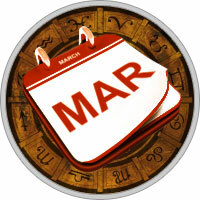 Health and energy are excellent this month, and especially after the 20th as the Sun enters your sign. You have all the energy you need to achieve anything you set your mind to. You can enhance health even further by giving more attention to the feet; regular foot massages will be unusually powerful this month. Your health planet went retrograde on February 23 and will be retrograde until the 19th, so avoid making major dietary changes, or changes to the health regime, until after the 19th. Be more careful in communication as well. A thoughtless word can have all kinds of repercussions that you never imagined. Your spiritual 12th house is still powerful until the 20th, so bear in mind last month's discussion. Now would be an excellent time to review the past year, evaluate your progress (or lack of progress), correct mistakes, forgive those who need to be forgiven and set your goals for the year ahead. Your birthday is your personal new year and is a very important time astrologically speaking. You want to start your new year with a clean slate. Mars will be conjunct to Uranus towards the end of the month, from the 27th to the 30th (although you will be feeling the effects before this). Avoid daredevil kinds of stunts and watch the temper. Aries children (who have been rebellious for a few years now) are more rebellious than usual. Avoid rush and impatience now, although it will be difficult - you are energetic and raring to go. Be more mindful on the physical plane.